IWC Flieger SS Cronograph 1806! IWC Flieger SS Chronograph 1806! 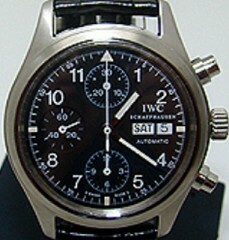 SS IWC Flieger Chronograph, Tritium dial, automatic movement, serial 2672,762. IWC SS strap & buckle, size is over 47 mm with lugs x 39 mm! Sell for $4500 or TRADE! Payment Details: Checks Within USA OK... Bank Transfers ONLY WorldWide!